With a fight against Anthony Joshua seemingly now not going ahead, Dillian Whyte hopes to fight Dominic Breazeale. April 20th at the O2 Arena in London has been booked by Matchroom Promotions and it is likely we will see Whyte take centre stage at the venue where he has headlined the last three events. 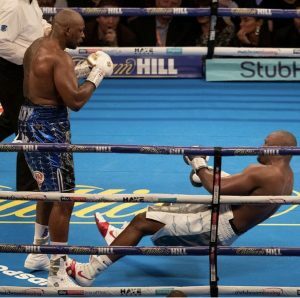 Whyte had been in the running to face Joshua at Wembley Satdium on April 13th. That event now looks likely to be cancelled with Joshua heading Stateside to make his U.S debut against Jarrell Miller in June at Madison Square Garden in New York. “The Joshua fight is dead. It is not happening at the minute, so we move on,” Whyte told Sky Sports. “Negotiations in business are very difficult. The fans don’t really see the ins and outs of that. We move on.” he continued. If Whyte had to pick one, which one would it be?